Whenever I am walking through the woods and find an abandoned car or worse a group of them it is unsettling. 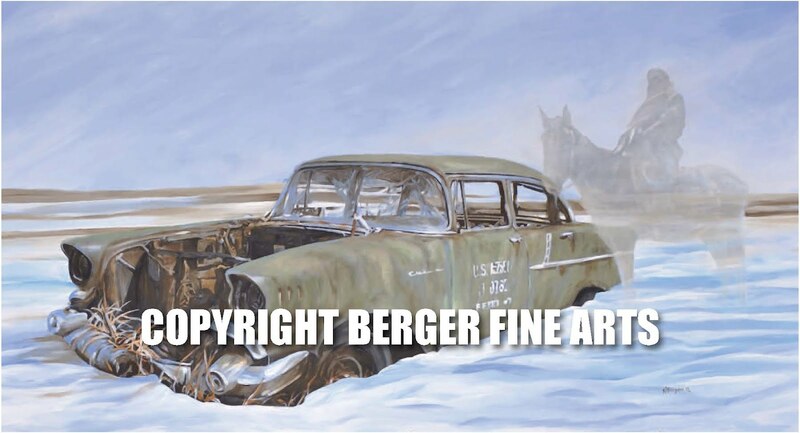 This scene shows a place that has multiple abandoned vehicles. It looks almost like a graveyard. I hope it conveys that same type of feeling to you. 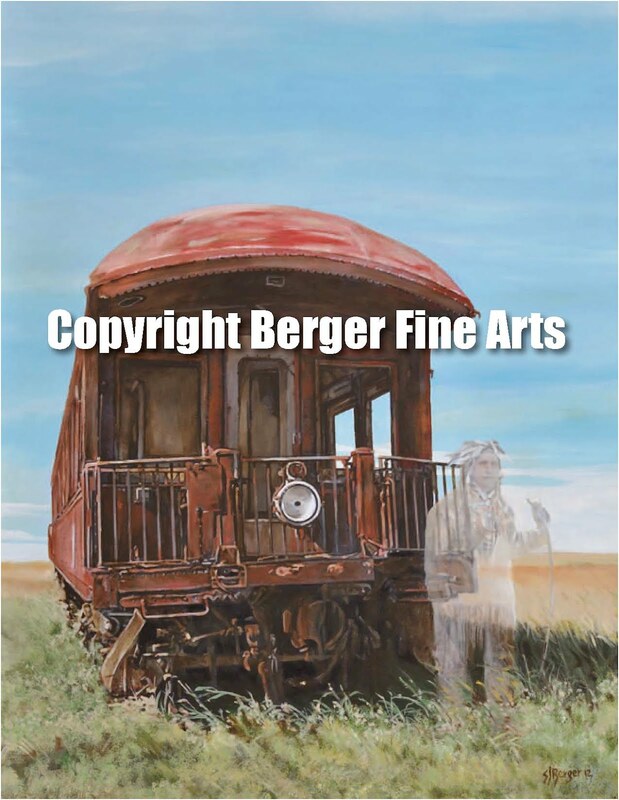 This concludes the first phase of the "Ghost on the Prairie" series. 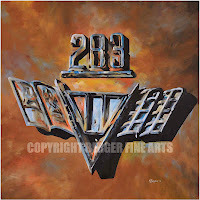 I will be doing more but I have to work on my next series of landscapes. The ghosts of past generations are all around us we just can't see them. 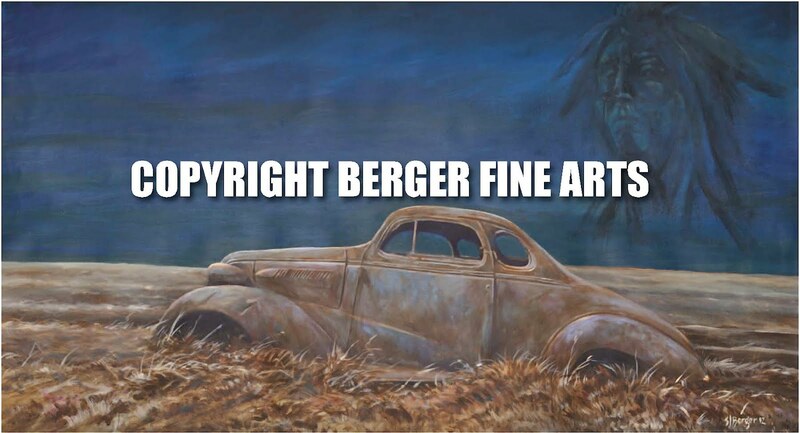 Whenever you see an abandoned car it has a history that is as intriguing as the people who originally owned it. The places it went, the miles it traveled all add to the mystery of its final rusting place. 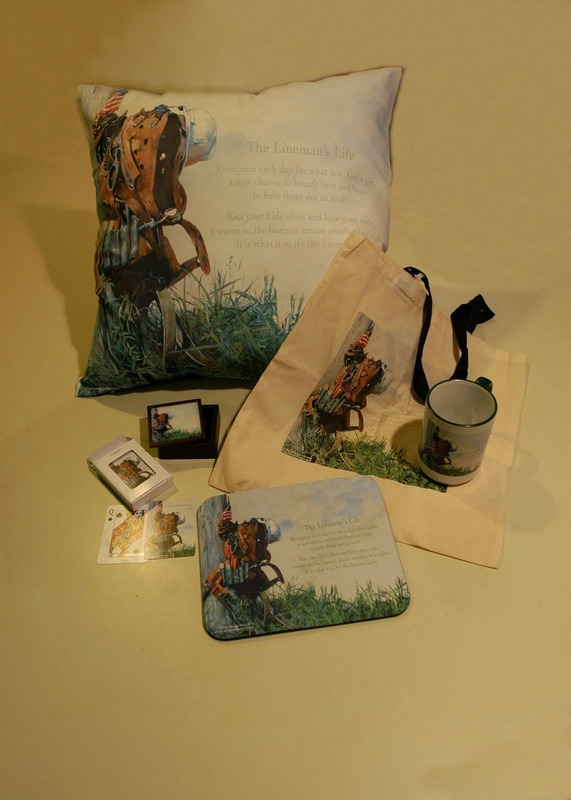 On the prairie and in the forests the spirits of the deceased visit these relics often and guard them. 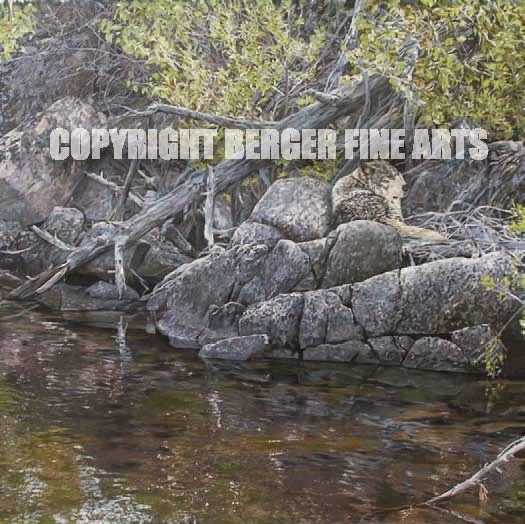 If you are interested in prints of this or the original go to the web site: www.bergerfinearts to the product page in the landscape category. Left alone in a field to rust away, what a waste. The only winter scene of the series. It makes you wonder why and what happened to the vehicle. 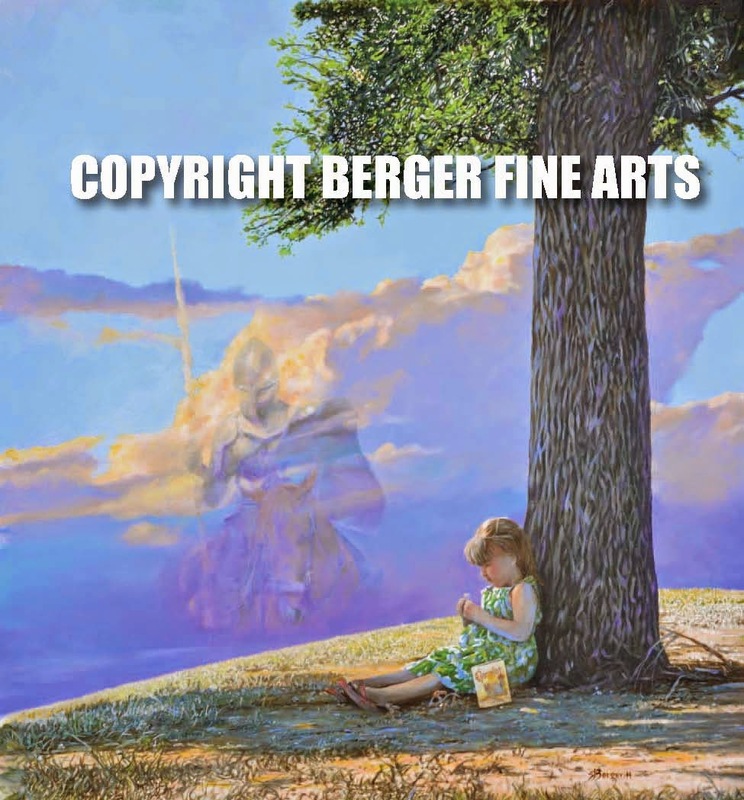 If you are interested in prints of this or the original go to the web site: www.bergerfinearts to the product page in the landscape category and you can make a purchase. 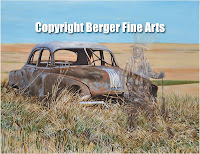 This is the first painting of this series that depicts the prairie at night. It also does not show a full body spirit. This piece of art seemed to need something a little different. I also experimented with colors in the sky and tried to put stars and a moon but the shading became an issue and it just became too much and not as interesting so much so that I felt it was taking away from the key focal points. 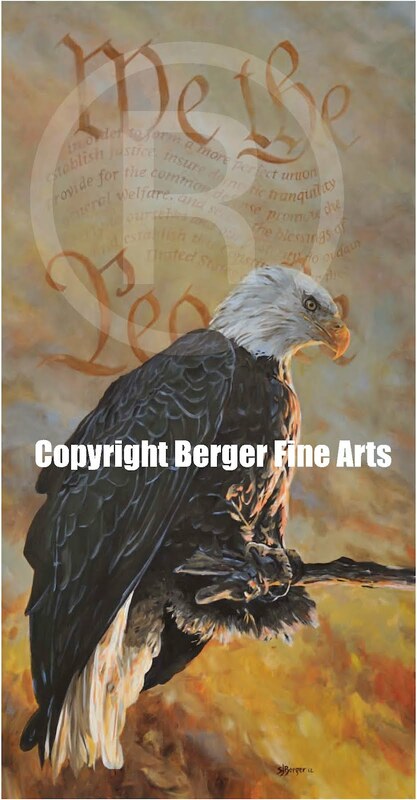 If you are interested in prints of this or the original go to the web site: www.bergerfinearts to the product page in the landscape category. 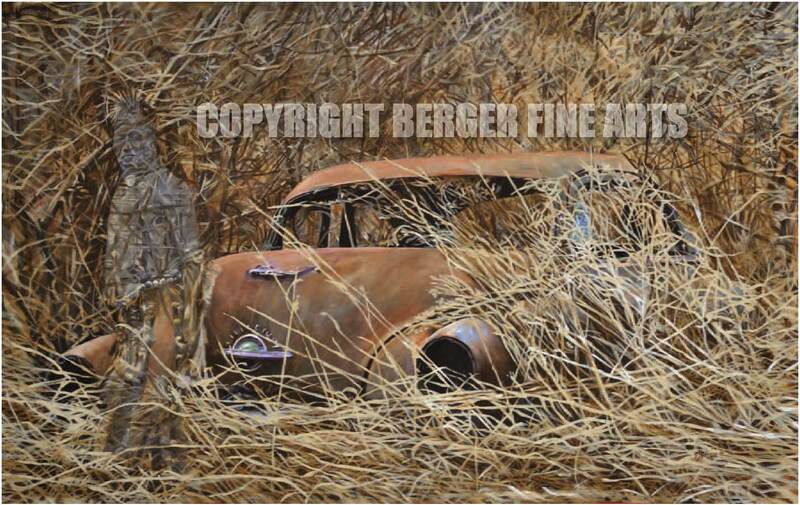 This painting shows a different view of an abandoned vehicle. 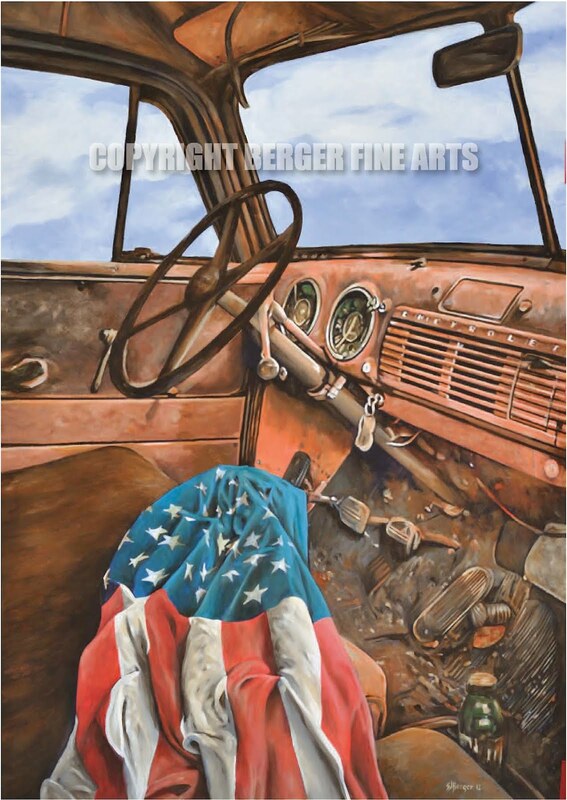 But you can not get more American than a Chevy truck and American flag. This is a little bit of a change-up to the ghosts on the prairie series but I think it adds to it. 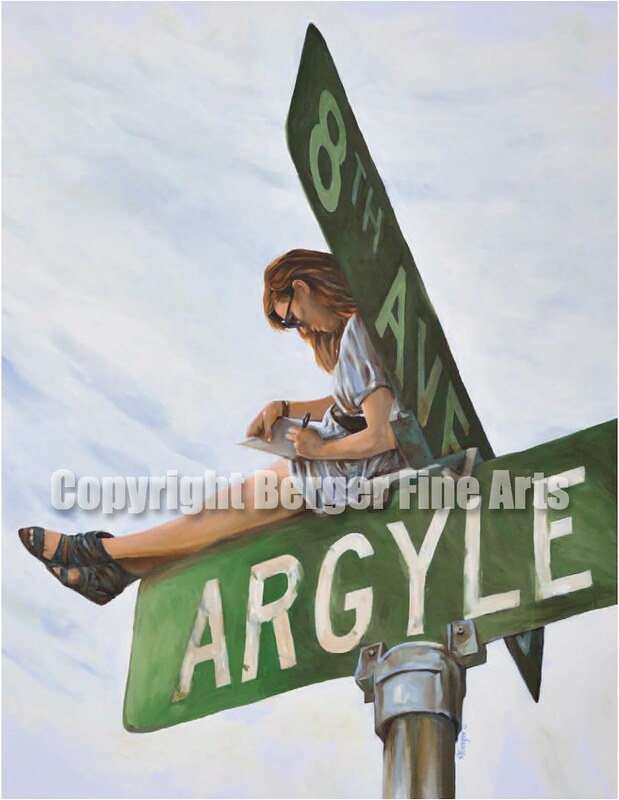 The original measures 24"x36" and is for sale. 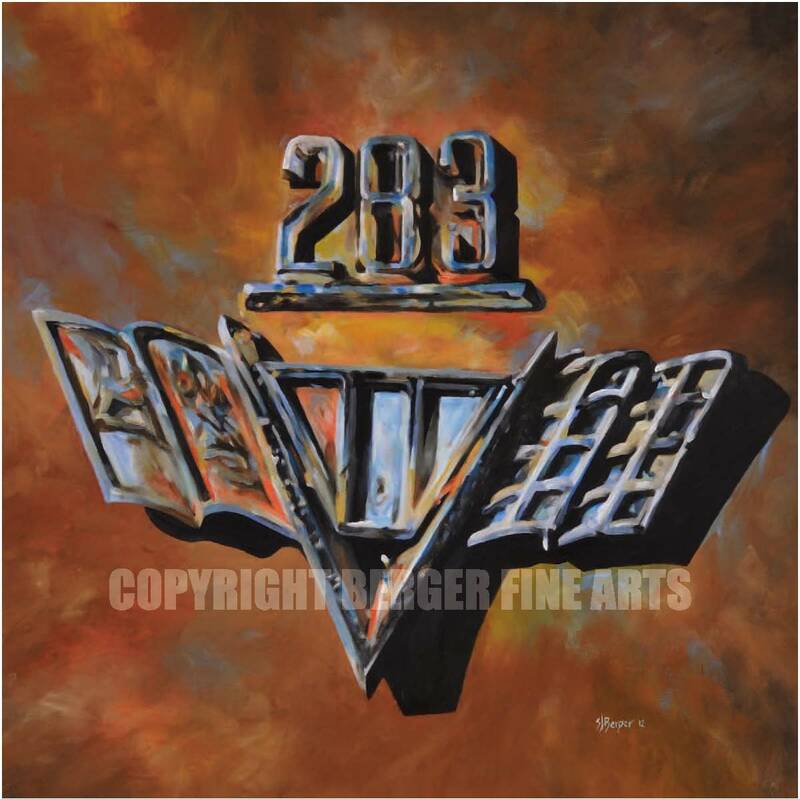 Signed 22″ x24″ Giclee prints on canvas are available of this painting for $150.00. The original is abvailable. 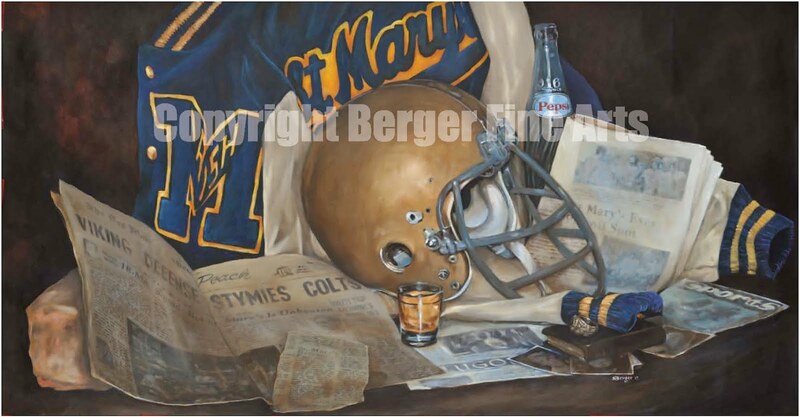 If interested in the original please email: steve@bergerfinearts.com. 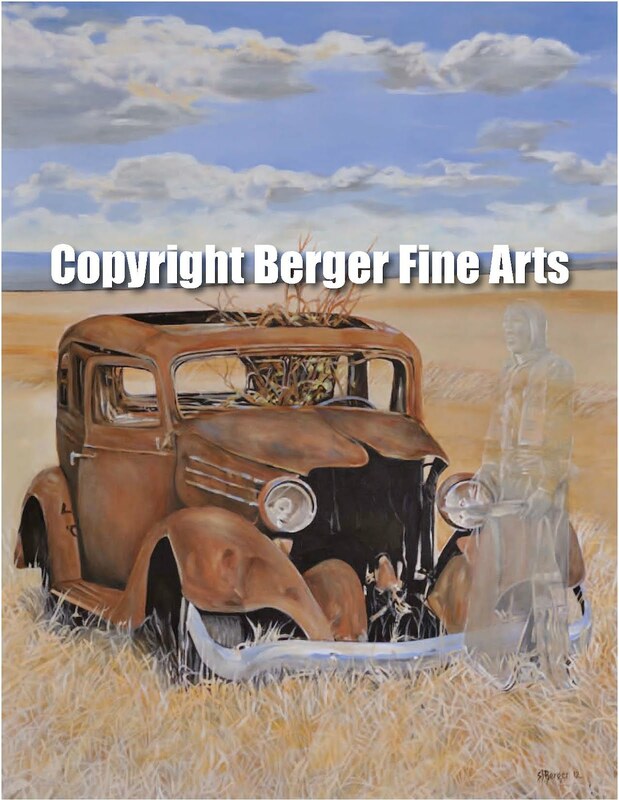 Go to www.bergerfinearts.com if you are interested in purchasing any of this series or any other artwork that I have done in the past. 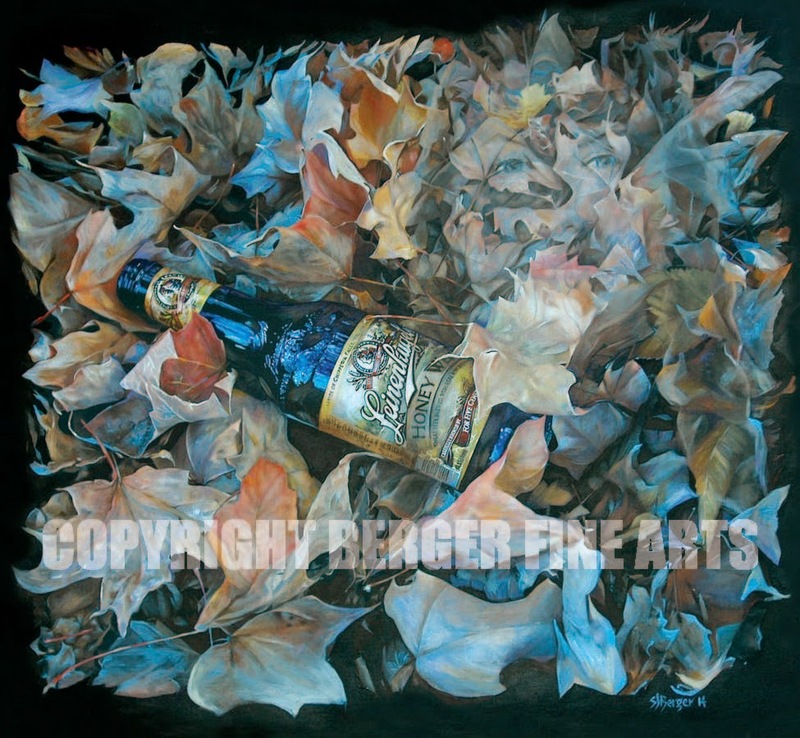 This painting is large 24"x38" and as you can see the imagery is much more complex. 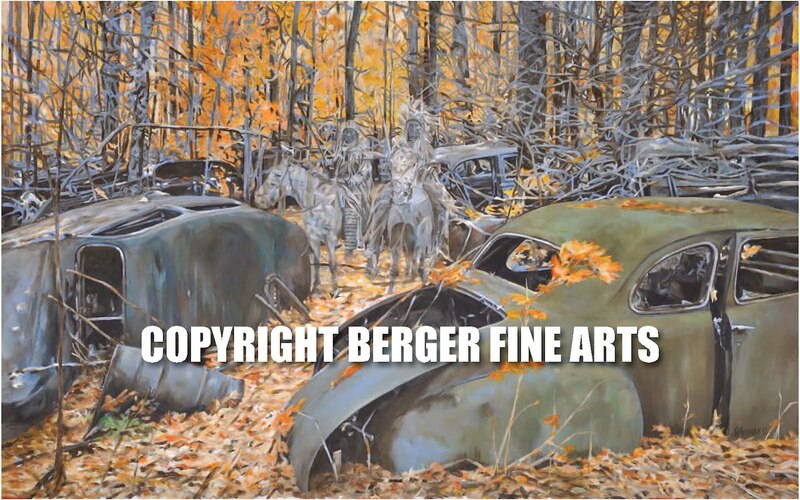 The colors of fall lend themselves to rusting vehicles like the one shown here but I am currently working on painting do this series that has fall colors, very vibrant. I should be ready to post in a few weeks. 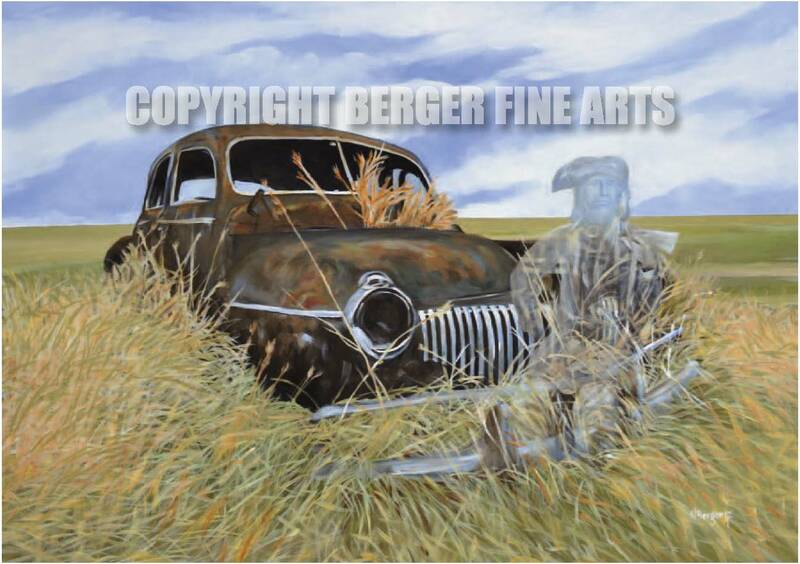 I have to stop myself from having the trees and grasses completely envelop the vehicle it just is hard knowing where to stop. 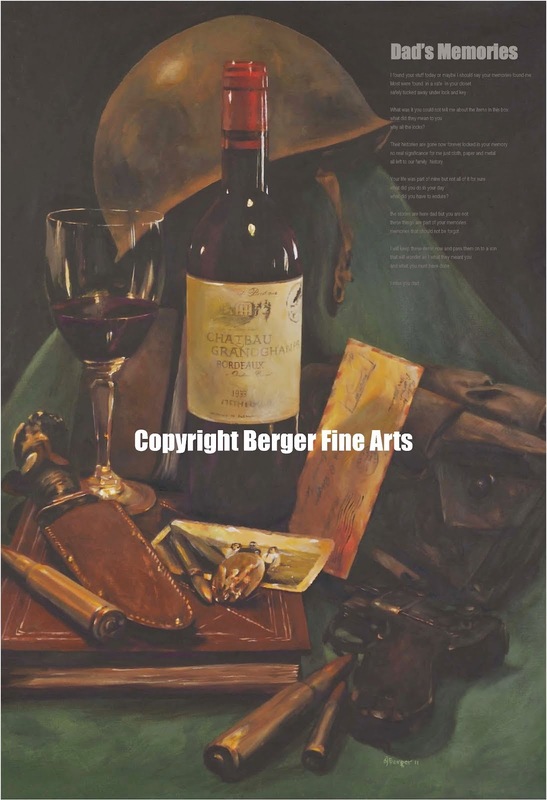 Go to www.bergerfinearts.com if you are interested in purchasing this painting or any other artwork that I have done in the past. Back to the series, this painting is a little bigger 24"x38" than I usually do but I like the feel of it. 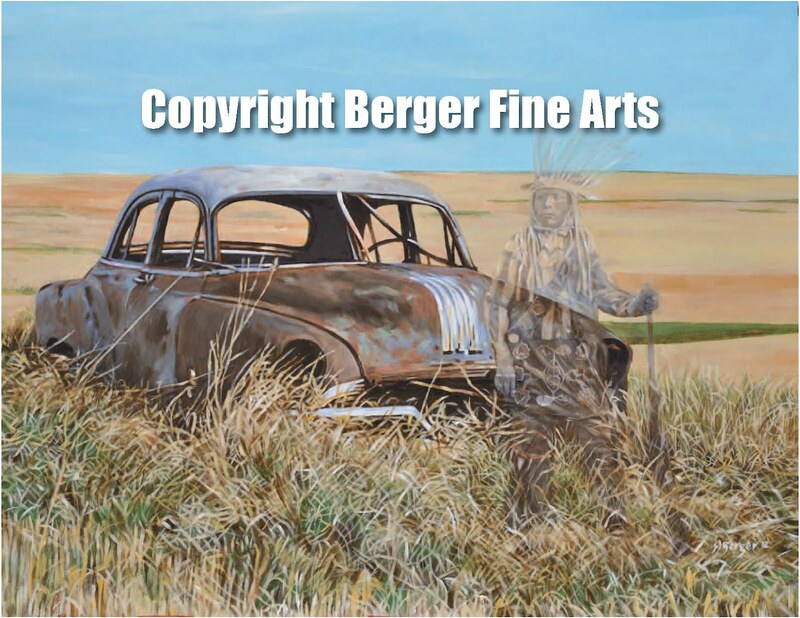 I have been debating on how transparent to make the native Americans in these paintings. Too much and I miss details too little and it looks confusing. I have notice that each one I do has it subtle changes to style to them. Something different I thought I would post this recent portrait of kids being kids. 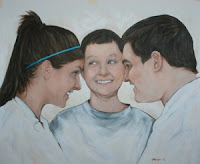 Fun painting to do. 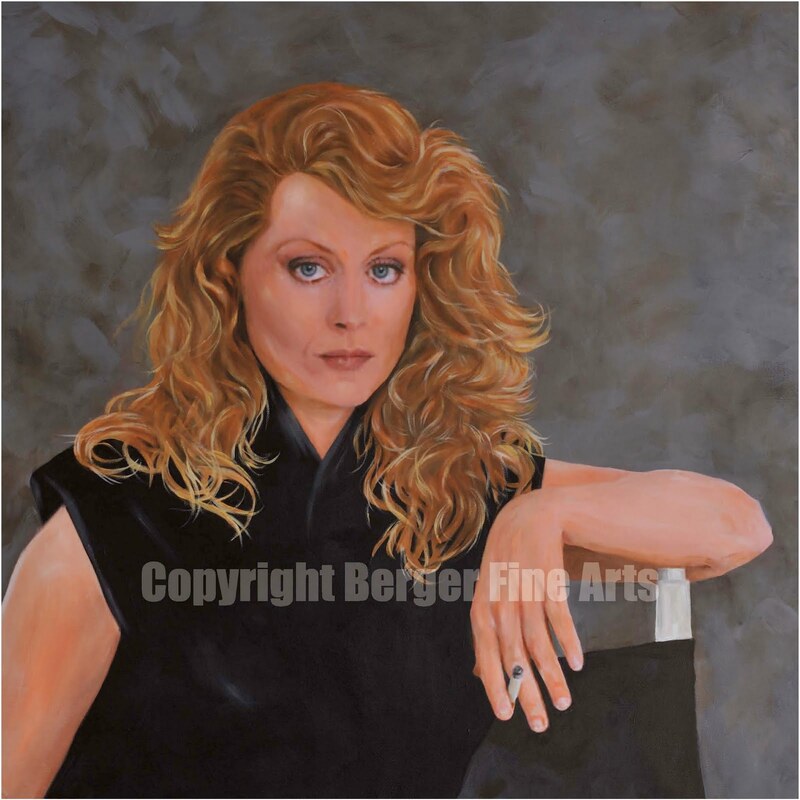 You can look for more portraits at my website under the Portrait section. 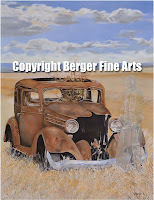 Go to www.Bergerfinearts.com to see more. 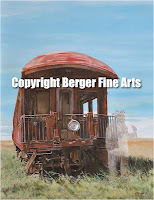 The fourth of the series does not depict a car but an old train car. Left abandoned on the prairie it has company. 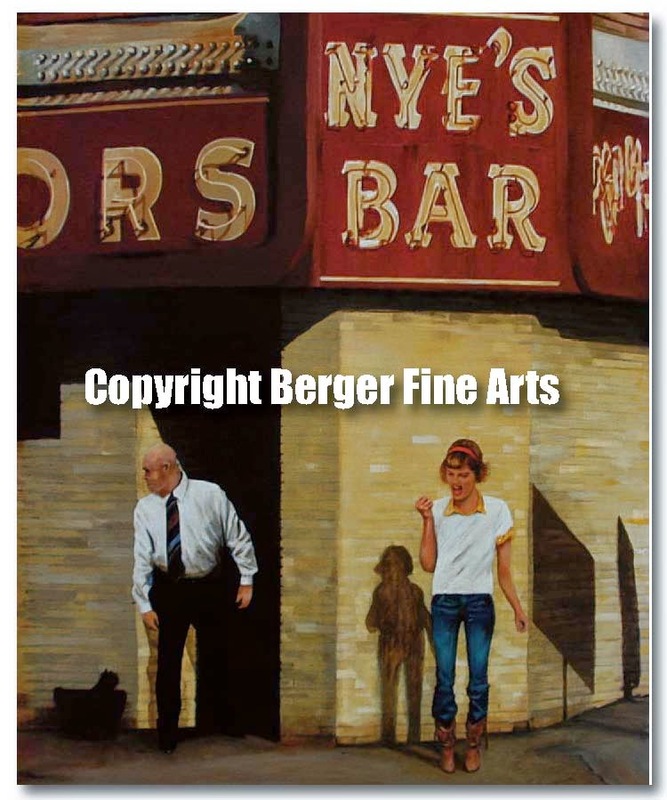 I did have a buffalo in this painting but decided to leave it out. 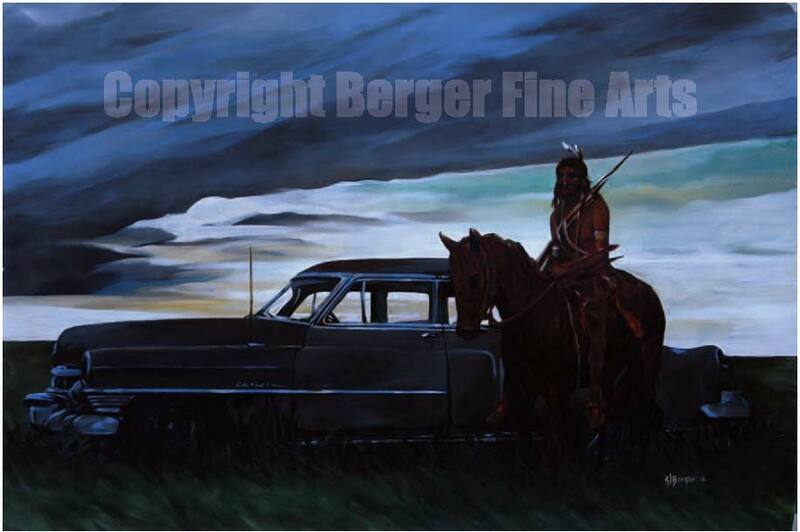 It just became to busy and I will have time to incorporate buffalo in another painting down the road. Noted in my previous post I will continue to update this series here. 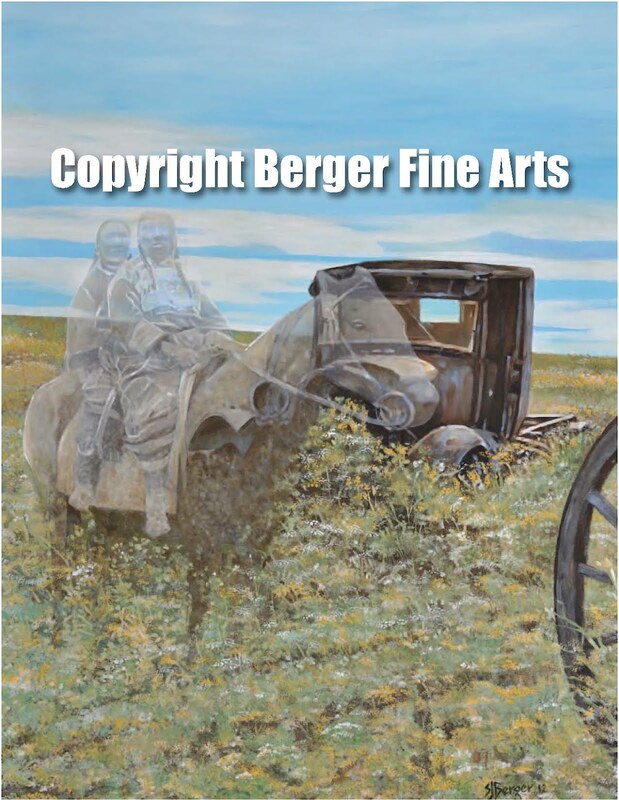 This one depicts a field with the combination of a Model T or A a wagon wheel that does not show all here in this image and Native American women on horseback passing through. I wish the colors would show up better in these posts. 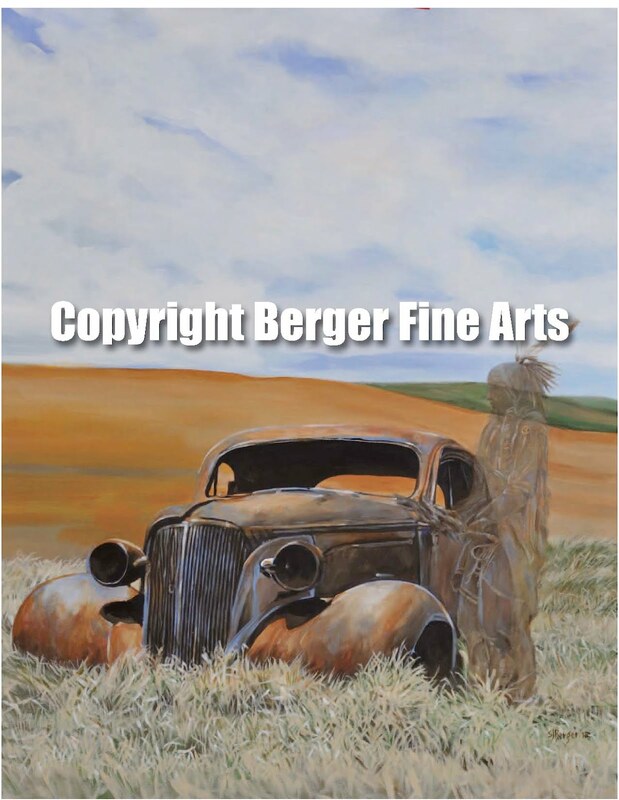 I have been working for some time on this series that incorporates rusted hulks of cars abandoned in the middle of nowhere and the Native Americans of years past that use to inhabit the areas where you find these old delapidated rusted out vehicles. I always wondered how these vehicles got to their final resting place (or should it be rusting place?) and how long before they totally disintegrate back into the earth. They almost look like bones that scavengers have pick through over time. Fun series to paint and as you will see with follow up posts I have been busy. Here is a reverse portrait. 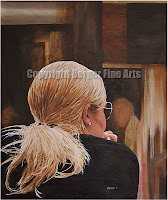 The challenge was painting someone from behind and make it look interesting. The soft choice of colors combined with the stark detail of the blonde hair became a very striking picture and one that can goe in almost any room if your blonde. 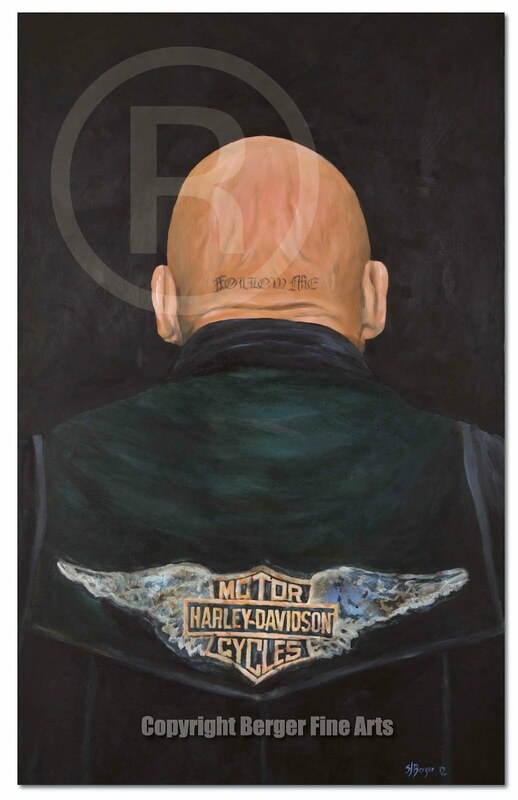 It has been a while since I painted so many portraits and this is just another to show another style of painting. Unlike past portraits and posts this one is a little softer in tone, reflecting a quiet but steely look. These are really fun to do. 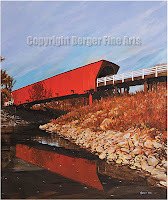 Here is another bridge close to Winterset. 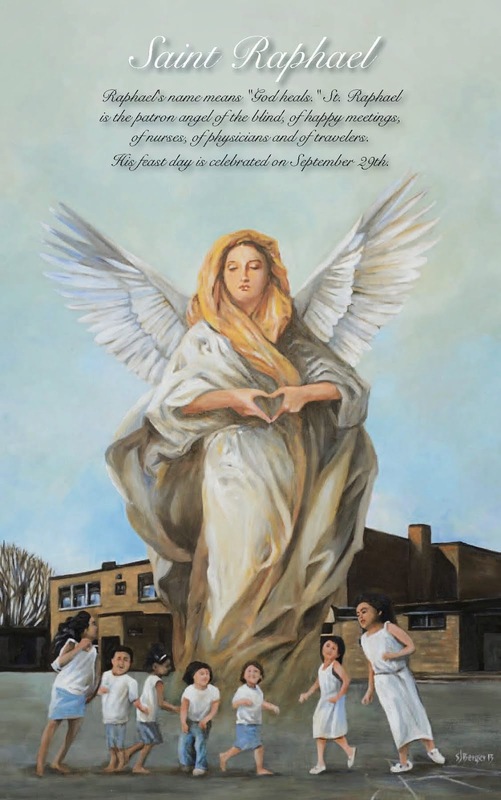 Beautiful setting for this in early Fall. 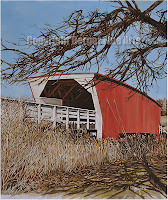 I have a few more bridges on the board from Madison county and will post as soon as I get the time to finish them. 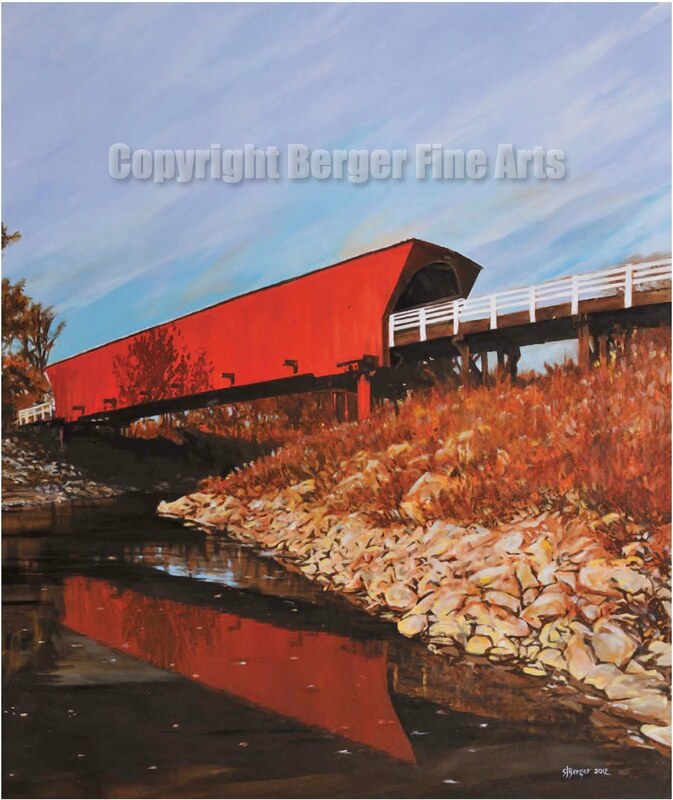 At least now that I have them started it is fun to review the bridges and their construction as well as the time spent in western Iowa painting them. Truly a beautiful part of the country at any time of the year. 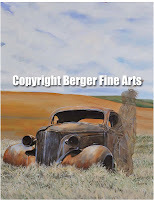 This is a recent landscape painting I did from watercolors I painted dating back to the late 1970's from Winterset Iowa. 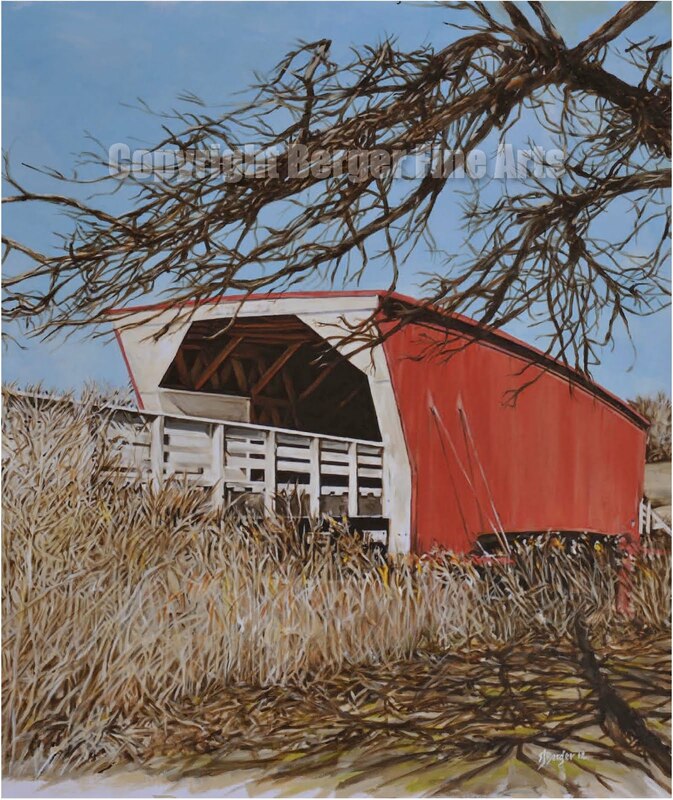 I spent three days traveling about western Iowa painting the covered bridges in the area. Wonderful place and wonderful time. 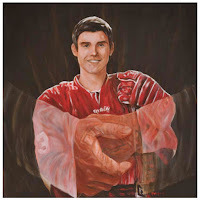 After I saw what happened to this young man I was compelled to do something for the family. I painted this to help show visually that Jack as well as the whole family is in Gods embrace, always. I hope it helps them as they go through the rehab process. 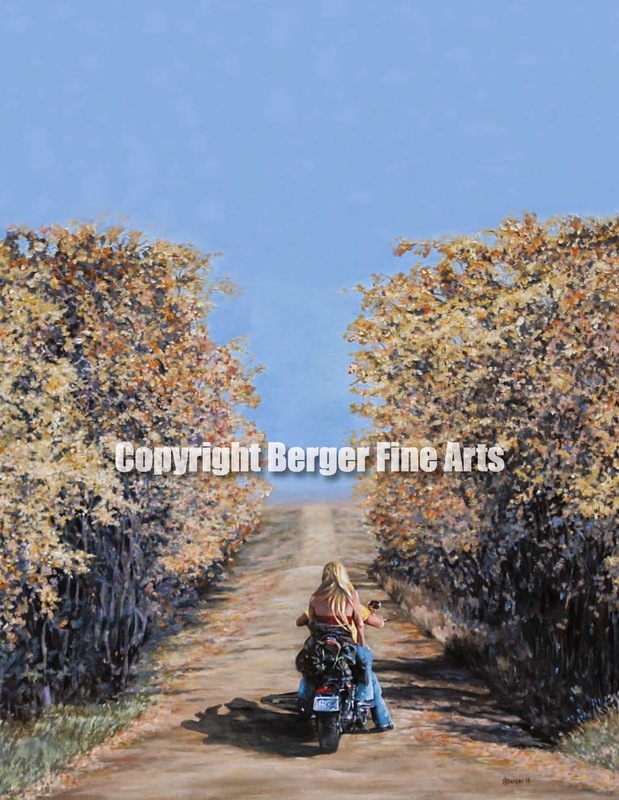 I classify this as Western art but some may call it more landscape art. 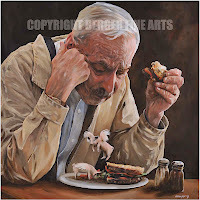 Either way it depicts a time and a way of life that has passed on. The colors here do not reflect very well from the original piece. Labels: Twilight on the plains. As promised here is the second famous Minnesotan portrait. Governor Dayton. 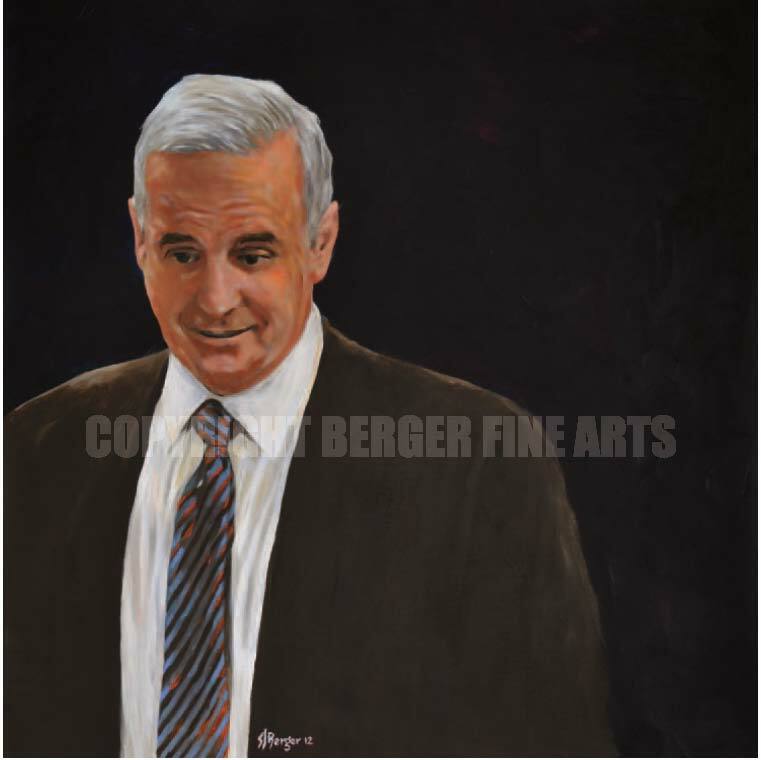 I painted Governor Dayton in a non traditional pose because I believe he is definitely not a traditional politician. He seems to be a genuinely nice man who cares for other people. 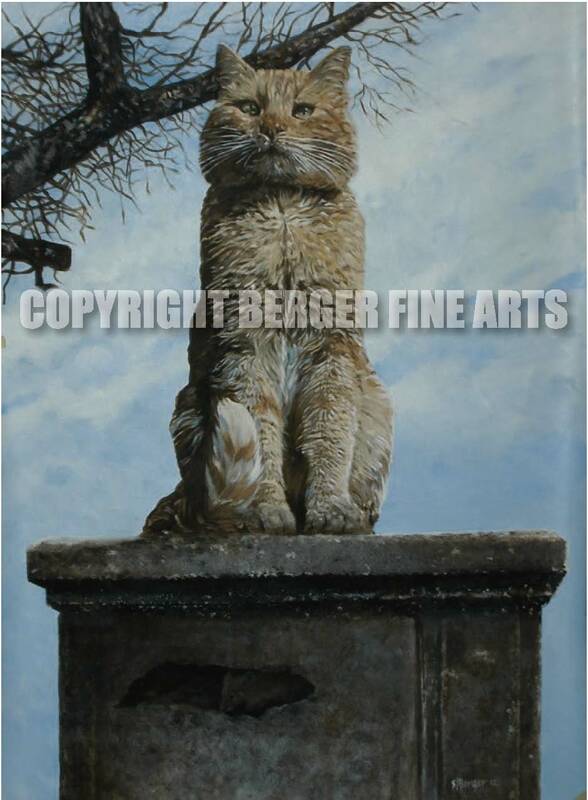 So the gentle smile and downward look I think helps to capture his spirit. 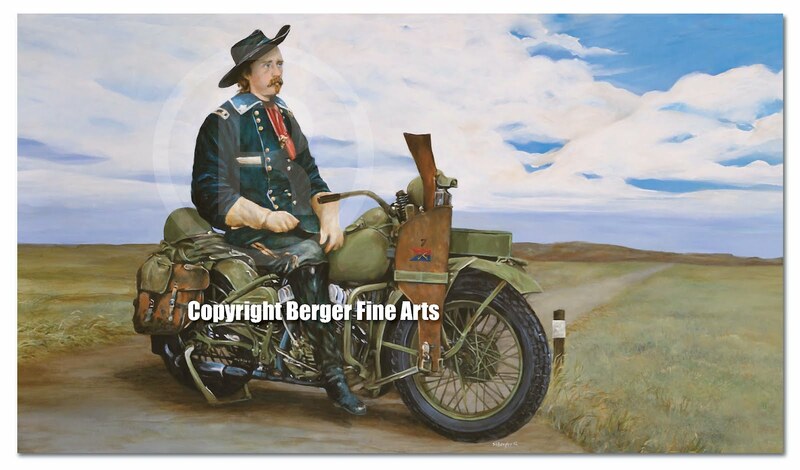 I was a little upset when I heard that the previous Minnesota Governor had an artist from another state do his official portrait that hangs in the state capital building. I am sure there are plenty of Minnesota portrait artists that would have loved the opportunity to do the work for him. Better to source it out I guess. At any rate this gives you a pretty good idea of where I would go with the subject matter. Labels: Governor Mark Dayton Portrait. After the holiday I did quite a few portraits and forgot how much I enjoy doing them. I will post a couple today of famous Minnesotans so that people can recognize who they are. This one of Senator Franken is purposely painted without any of the political props that come with his name since becoming a senator. I like to keep it uncluttered and to the point. 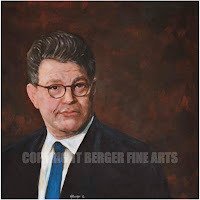 Senator Franken has a unique smile and look and and definitely has a lot of hair to work with.